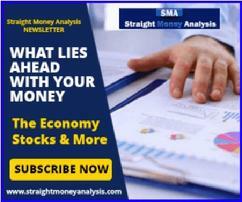 Straight Money Analysis is committed to providing the most timely and relevant world-wide business and financial news to its subscribers. This information is designed to provide a comprehensive overview of the most important pertinent facts about what is taking place in the domestic and global economy. Because of the acceleration of globalization and international trade, Straight Money Analysis will give you the essential information to gain a greater understanding of the changing logistics currently underway in the world's economy. The Topics discussed quarterly are often Historic, for the purpose of providing direct correlations to those current events in the news that are effecting major policy decisions of commercial institutions. It is with profound sadness that I announce today December 27, 2018 the passing of my long time friend and Co- Editor of the News Letter Straight Money Analysis.com Andre M. Eggelletion. Andre had been a contributor to Straight Money Analysis from the very first issue of the news letters publication beginning in September of 2009. Andre's insight into the area's of the US Economy and Federal Reserve Monetary Policy was invaluable in understanding Globalization. It is my wish to convey to the family of Andre my deepest sympathies and condolences. I have personal experience with Joseph Meyer and received valuble knowledge from his Straight Money Analysis newsletters, Joseph is extremely knowledgable of world events and understands the world financial system as well as he is willing to speak personally with his clients and answer any questions you may have, Joeseph is quite honestly a gentleman and a scholar. I first literally heard of Joseph on Coast to Coast am and now enjoy his work on Caravan to Midnight hosted by John B Wells, Joseph is a regular guest on the show and displays his knowledge and understanding of current and historical world and financial events. You will not go wrong investing in his Straight Money Analysis newsletter. It has definately helped me in developing my investment portfolio for growth and planning for future market vulnerabilities. I look forward to the next time Joseph and I speak and the next newsletter. How is Joe Meyer's Newsletter different?